Stephen King's Dark Tower series has been referred to as King's "magnum opus," and for good reason. None of his numerous novels will ever compare to the mastery of this series. We follow Roland, the last gunslinger in a universe parallel to our own, on an epic quest to the enigmatic Dark Tower, which is a sort of energetic magical center point connecting many universes--including our own--and keeping them alive. The Tower is in grave danger, and it seems only Roland can save it. This story spans multiple genres and muses on many lofty philosophical themes. It is a wonderful, golden tale. 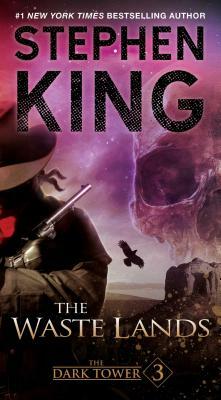 The third volume in the #1 nationally bestselling Dark Tower Series, involving the enigmatic Roland (the last gunfighter) and his ongoing quest for the Dark Tower, is “Stephen King at his best” (School Library Journal). Several months have passed since The Drawing of the Three, and in The Waste Lands, Roland’s two new tet-mates have become trained gunslingers. Eddie Dean has given up heroin, and Odetta’s two selves have joined, becoming the stronger and more balanced personality of Susannah Dean. But Roland altered ka by saving the life of Jake Chambers, a boy who—in Roland’s world—has already died. Now Roland and Jake exist in different worlds, but they are joined by the same madness: the paradox of double memories. Roland, Susannah, and Eddie must draw Jake into Mid-World and then follow the Path of the Beam all the way to the Dark Tower. There are new evils…new dangers to threaten Roland’s little band in the devastated city of Lud and the surrounding wastelands, as well as horrific confrontations with Blaine the Mono, the piratical Gasher, and the frightening Tick-Tock Man. The Dark Tower Series continues to show Stephen King as a master of his craft. What lands, what peoples has he visited that are so unreachable to us except in the pages of his incredible books? Now Roland’s strange odyssey continues. The Waste Lands follows The Gunslinger and The Drawing of the Three as the third volume in what may be the most extraordinary and imaginative cycle of tales in the English language.